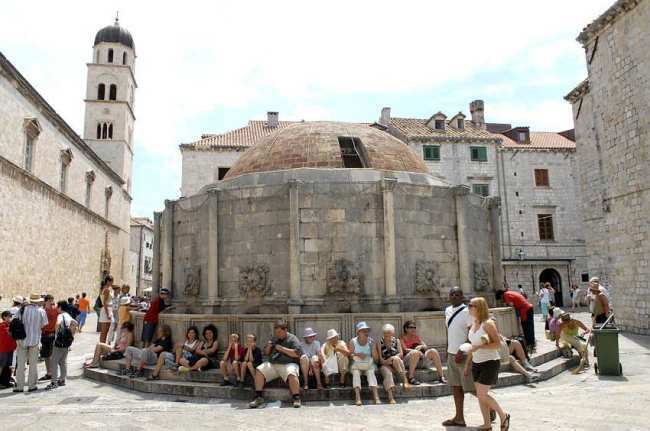 During a walking tour of Dubrovnik, you’ll certainly notice two distinct fountains–one big and one small of similar design. These are called Onofrio’s Fountains, built by the city’s aqueduct architect, Onofrio Giordano della Cava. Dubrovnik fountains are probably one of the city’s most distinctive features, and serve as frequent photographing scenery for tourists. Della Cava was entrusted with the task of building Dubrovnik’s aqueduct system during the 1430s. Construction began on the system in 1463 starting in Sumet, near Dubrovnik. Another builder was to be della Cava’s partner, Andreucius Bulbito, but documents dated later only make mention of della Cava and so Bulbito’s role remains known. Their builder’s contract was quite interesting and perhaps even fair, considering the nature of their task. According to the contract, their compensation would be slashed for every drop of water lost along the aqueduct’s way. This of course never happened as their structure was flawlessly executed. After the aqueduct was completed, della Cava set his eyes on the construction of two Dubrovnik fountains. Today they are known as Big Onofrio’s Fountain, located on the Poljana Paskoja Milicevica in front of the St. Savior Church, and the Small Onofrio’s fountain, which sits next to the city’s famous bell tower. To this day, Dubrovnik still receives its water supply from the same spring in Sumet where della Cava’s aqueduct began and his fountains remain for all to admire in the Old Town as well. If you find yourself near Dubrovnik fountains, take your camera and snap an image. Don’t forget to upload it to our Facebook Wall and earn a chance to become our media contributor of the day. Interested in reading about some silly question the tour guides got in Croatia? Just click here. For more information about Croatia and its impressive destinations, check out our Destinations Section.